Sketches from Summer hill and Newtown, NSW Australia. Graphite on paper. This is the beginning of a journey into the world of character animation. A little while back I applied for a place in the renowned online animation school, Animation Mentor. I was over the moon to have been accepted in this 18 month program and have just started the Character Animation program. In short this program will prepare me to become a character animator for feature film (like Toy Story, King Kong, Avatar etc). 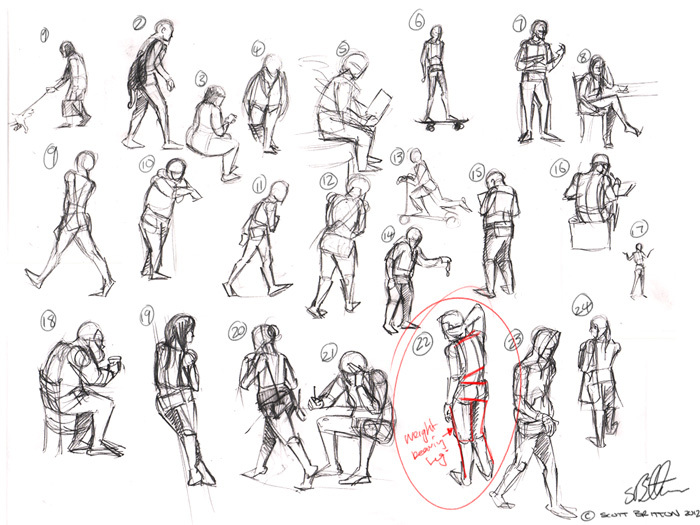 This week marks the second week of class 1 (12 weeks), the first week was mostly orientation and getting used to the online format and this week (week 2) we have our first assignment: Go out and sketch people doing various daily activities and try to capture the essence and mood of the pose/action. Then, select a pose from your sketches and re-create it using a supplied character rig (3D character model). I will be posting my progress through the course every week so keep checking back to see where im up to and PLEASE leave feedback below, even if you don’t think you know what your talking about, let me know whats working and whats not for you – it’s extremely helpful! This article was posted in AM. Bookmark the permalink. Follow comments with the RSS feed for this post.Comments are closed, but you can leave a trackback: Trackback URL.